Will you be waiting in line? 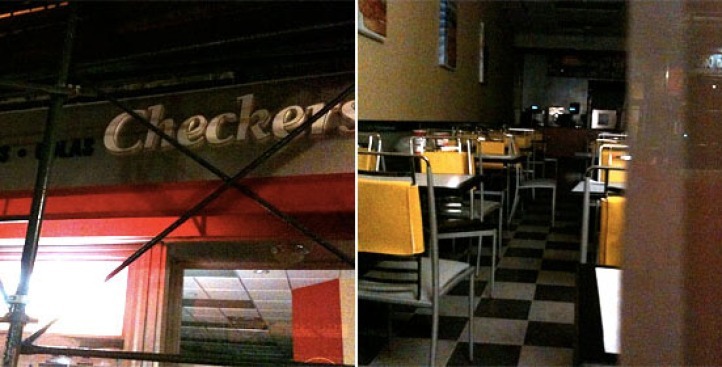 Last night we observed the following at the Checkers going into 77 Chambers Street: an illuminated sign in the window; some signage up above, and through a crack in the construction paper, evidence of a burger joint ready to open at any moment. Not only are the tables set up, as you can see here, but there are advertisements on the walls, and we even spotted cups on one of the tables, as if someone had just been sipping a banana shake. Sure enough, a call reveals it’ll open tomorrow or the next day (hours: 10 a.m. till midnight). With the opening so close we can taste it, we have to ask — just how do the southeastern-based drive-in chain’s burgers stack up, anyway? Here are some early assessments of the Brooklyn Heights location. The quarter pound cheese burger was actually pretty decent. It came with lettuce, tomatoes, mayo, ketchup, pickles, and onions … The burger is what a fast food burger normally taste like, so I wouldn't say rush out there to try it. If you know and like fast food burgers, this one is ok … The fries are nice and crisp, and they're never under seasoned.